Review by AllTheBestFights.com: 2017-03-18, good start between Adrian Granat and Alexander Dimitrenko: it gets three stars. The undefeated Adrian Granat entered this fight with a perfect record of 14-0-0 (13 KOs=93%) and he is ranked as the No.23 heavyweight in the world. He fought four times last year winning over Evgeny Orlov, Samir Kurtagic, Saul Farah and Franz Rill. His opponent, Alexander Dimitrenko, has a boxing record of 39-3-0 (25 knockouts) and he entered as the No.41 in the same weight class. He lost to Joseph Parker in 2016 (=Parker vs Dimitrenko) but he came back to win in 2017 beating Milos Dovedan. 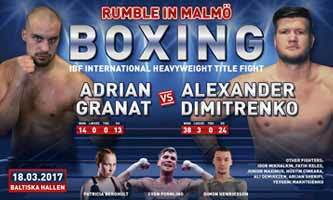 Alexander Dimitrenko vs Adrian Granat is valid for the IBF International heavyweight title. Watch the video and rate this fight!